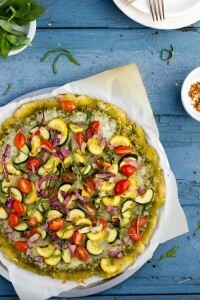 Zucchini, yellow squash and onion add a smoky flavor to pesto gluten-free pizza when they first spend a little time on the grill. Place zucchini, squash and onion slices on a large plate. Drizzle with olive oil and season with salt and pepper. Toss to make sure all the vegetables are evenly coated. Heat the grill to medium and place all vegetables on the grill. Grill until vegetables are fork tender and cooked through, 10-15 minutes. Let cool and cut vegetables into thin slices. Pre-cook pizza crust if needed. Pre-heat the oven to 375° F. Spread the pesto sauce on the pizza crust, top with cheese, chopped grilled vegetables and cherry tomatoes. Bake pizza until pizza crust is cooked through and cheese is melted, 15-20 minutes depending on pizza crust. Top cooked pizza with chopped basil leaves and serve. Nutrition Analysis: 300 cal, 20 g fat, 25 mg chol, 480 mg sodium, 17 g carbs, 2 g fiber, 5 g sugar, 13 g protein.